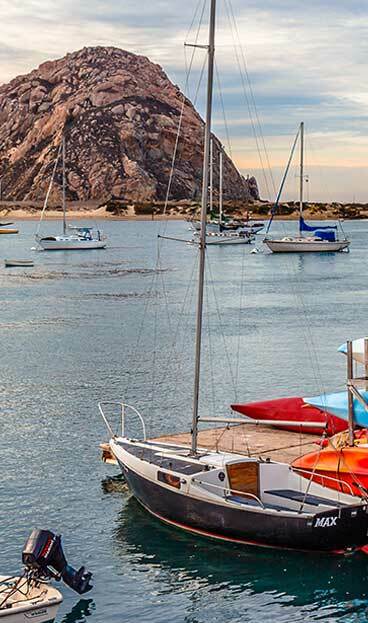 Kayak, Canoe, Stand Up Paddleboard, Surf, Sail, Swim, Boat…there are a lot of adventures to be had on the water in Morro Bay. Protected waters and moderate year-round temperatures make Morro Bay a perfect place for beginner and experienced kayakers. Kayaking is a great way to see the wildlife on the way and is a great individual, family or group activity. With a calm bay and rich estuary ecosystem to explore, Morro Bay is the perfect place to enjoy a stand up paddleboard session. For beginners check out one of our paddleboard shops who offer lessons with their rentals, and for more experienced paddlers we challenge you to see how many different under the sea creatures you can spy that call our estuary home. Fun and sometimes challenging winter conditions make Morro Bay a popular surfing spot. From watching the locals to the annual competitions, Morro Bay is a great place to observe the surf. You can also try your hand in the water with lessons and board rentals – just don’t forget the wetsuit.